After she quit the Comédie Française in 1880, Bernhardt and her troupe departed Le Havre for America arriving in New York on October 27. She had her first Sarony session thereafter and, not surprisingly, she could be très difficile. Oscar was a great admirer of Bernhardt, but I don’t think he would have made a point of standing in the same place—and was probably unaware. It may have been a quirk of Sarony’s or mere coincidence, but I wonder if he (or anyone else) ever realized that he did? We can verify the relative positions of Bernhardt and Wilde by examining the wallpaper patterns and wainscoting reliefs behind them. By doing this one other point of interest emerges. Bernhardt and Wilde were never photographed together, so it has not been possible before now to compare their relative stature. However, the identical background (and rescaling) allows us to see how Oscar at 6’3″ would have appeared alongside Sarah, a foot shorter at her recorded height of 5’3″. This difference would have been more marked if Sarah had been wearing heels, and had Wilde not been leaning, as in this juxtaposition. More on Sarony and the photographs. The Sarony Photographs of Oscar Wilde (complete). The Photographic Times, Volume XXIX, 1897. The Topeka Daily Capital, January 23, 1882. The story of the Sarony payment to Wilde will be the subject of a future article. Sarony probably had a hot spot in his studio with cameras and lights positioned for optimum effect. I think it would be more remarkable if his subjects were in different positions. I’m sure, John, you will be able to unearth more examples with similar backgrounds. No, haven’t see any, not that exact. 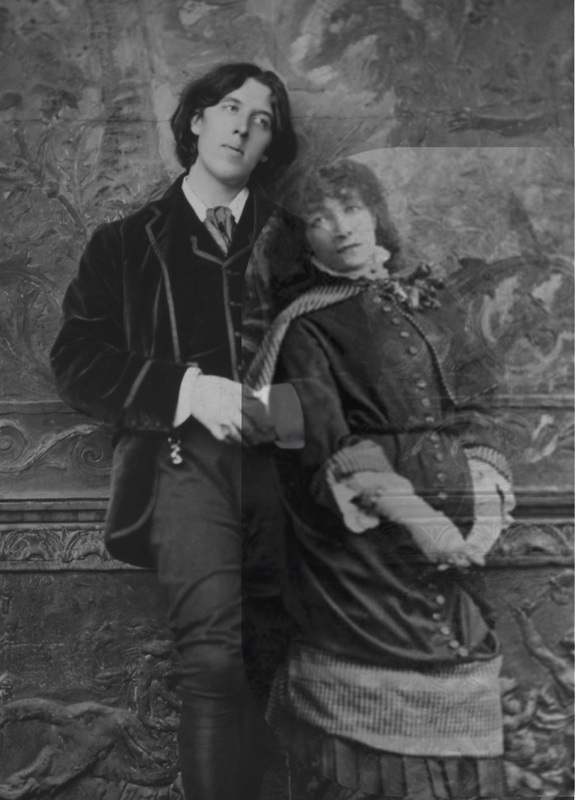 In fact, I haven’t found any others with that background: just Wilde and Bernhardt. Probably a prop wall that ended just out of shot; possibly one of several that could be moved around the studio. I was aware that the backgrounds in many, if not most, Sarony pictures, are backdrops. But there is one of Bernhardt (laying on a couch) showing a different section of the same wall ending at a column? Even if it is a prop, I have not seen that particular one in any other Sarony pictures (yet)—which perhaps makes it just as coincidental.